Forty people trapped for over two weeks by fierce fighting between the Syrian army and rebels. The Greek Orthodox Patriarchate of Antioch in Damascus, Most Rev Ignatius Zakka, has appealed for help for a convent in Syria where 40 nuns and orphans have been trapped by fighting for over two weeks. The monastery of St Thekla in the Christian village of Maaloula, north of Damascus, is running very low on basic food and medical supplies and cannot replenish its stocks due to the fierce fighting between the Syrian army and rebels. Mgr Zakka has called on the Syrian Red Crescent as well as the International Red Cross and other aid organisations to try to reach them. 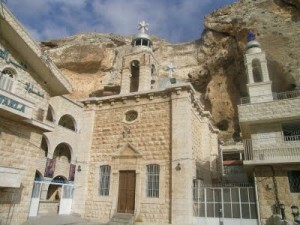 The historic village of Maaloula has been the scene of intense battles between the Syrian Arab Army and foreign-backed rebels. Armed jihadists of the Al-Qaeda-linked al-Nusra Front initially overran the village. Units of the Syrian Army are reported to have regained of some areas but Syrian news sources tonight say the situation is still tense and clashes are continuing in several areas. The Greek Orthodox monastery of St Thekla located in the Christian village of Maaloula usually receives large numbers of Christian and Muslim pilgrims as well as many tourists. Many churches in Syria are reported to have been destroyed or damaged.